Hey everyone! 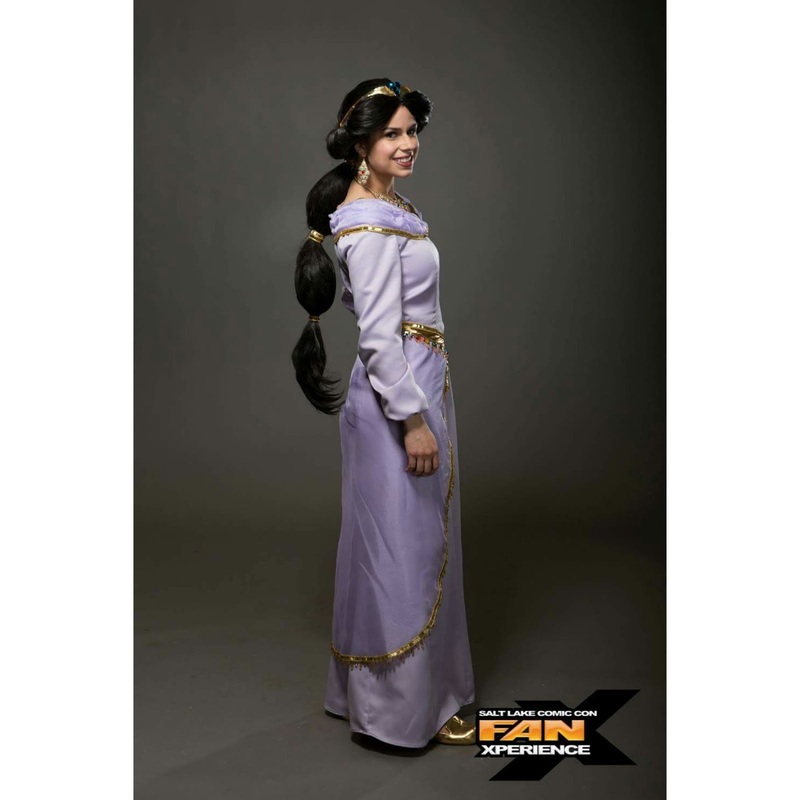 I made this Jasmine costume for the 2015 FanX convention in Salt Lake City. 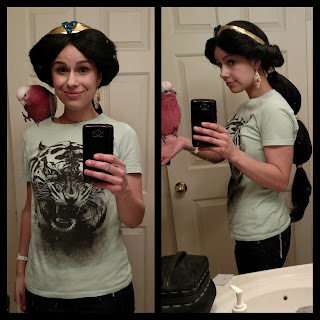 Someone on Pinterest asked if I could post a tutorial on how I styled the wig, so here it is! I braided the front & back of the wig before I started working on each section in order to prevent tangles. I styled the front by basically ratting the hair to give volume. 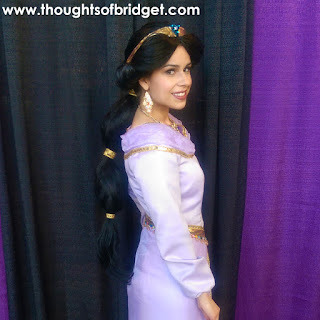 The wig was already parted in the middle, I used those long sections to add volume in the front. 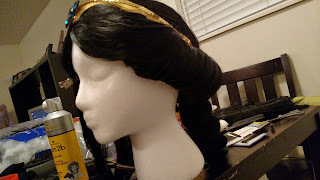 I placed the headband on the wig as I was styling to get an idea of how to place the hair in relation to the headband. 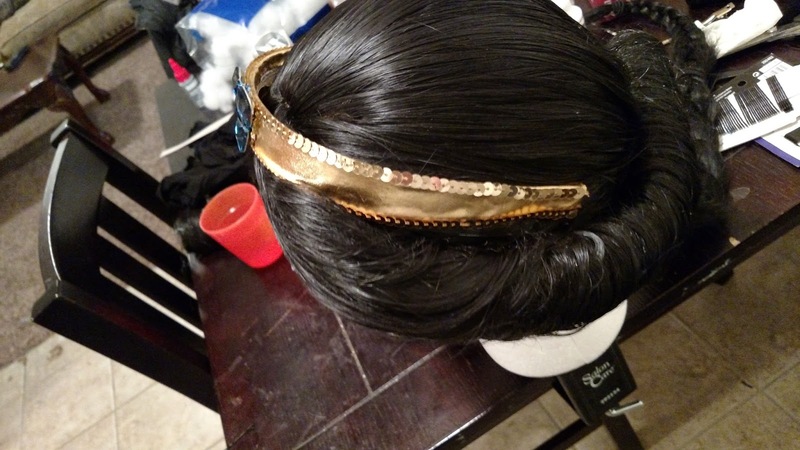 I think this part is pretty straight forward...and definitely one of the easier parts of styling this wig. This is where things got a little trickier. I used the pipe insulation to give volume and shape without adding too much weight. I chose the rubberized kind because it is more flexible than the full Styrofoam. First I glued the hair from the synthetic braid (from Sally's) onto the insulation. 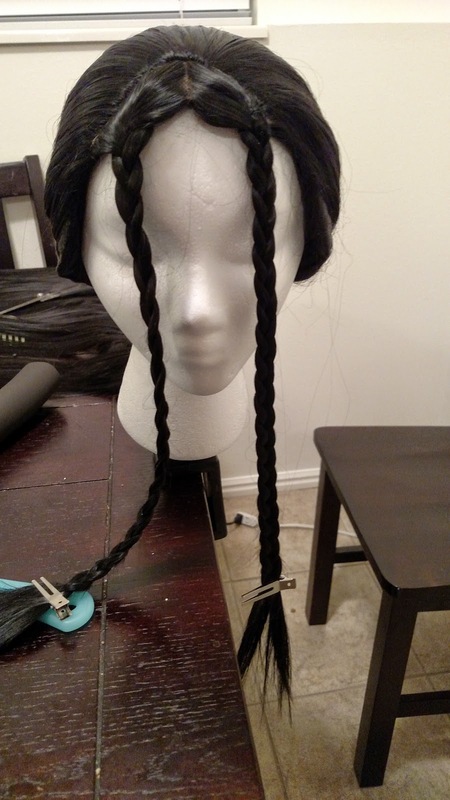 The synthetic hair braids are really cheap (around $2/package) compared to the wefts. So I put it on the insulation in case the other hair moved or showed through, you would just see more hair underneath. 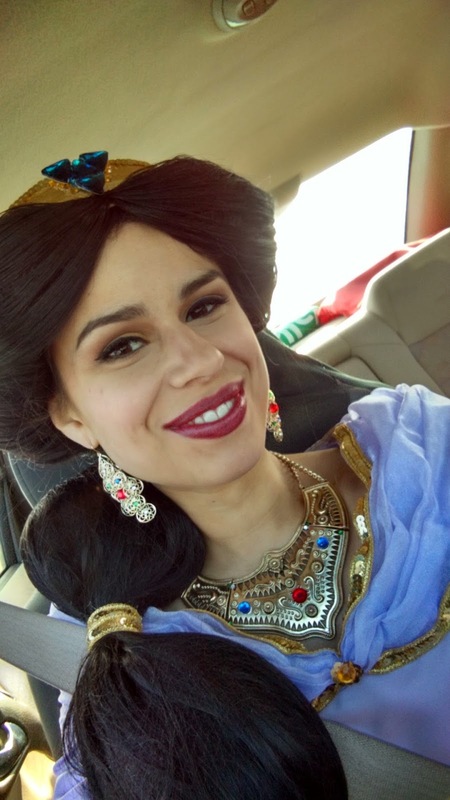 I used the Jewel It glue as my adhesive. 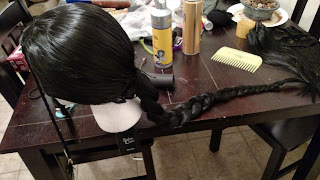 Next, I sewed wefts onto the INSIDES of the left & right sides of the wig. 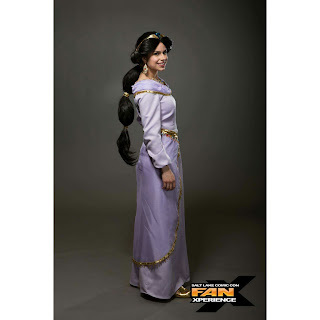 Each weft started just in front of the ear and ended at the back of the wig. I wish I had more pictures of this--but I forgot to take photos until it was too late! 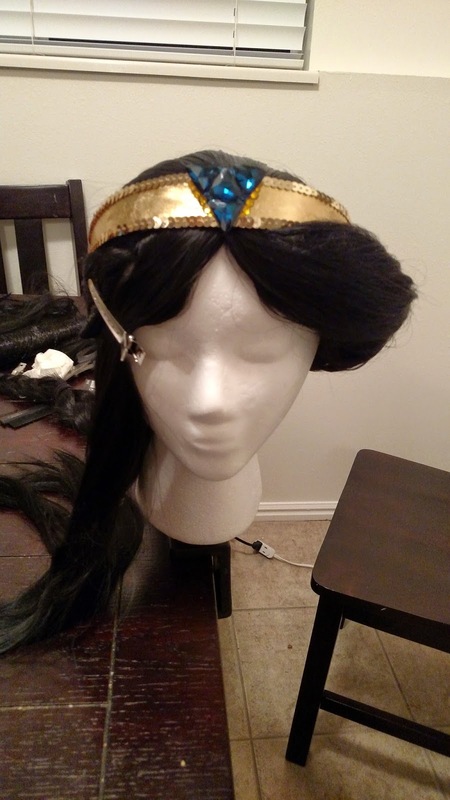 Once the wefts were sewn on, I rolled sections of them around the hair-covered pipe insulation so that it was pretty snug against the side of the wig. I poked bobby pins through the pipe insulation so that I could pin it to the wig. I then used the Jewel-It glue to keep the rolls attached to the wig. 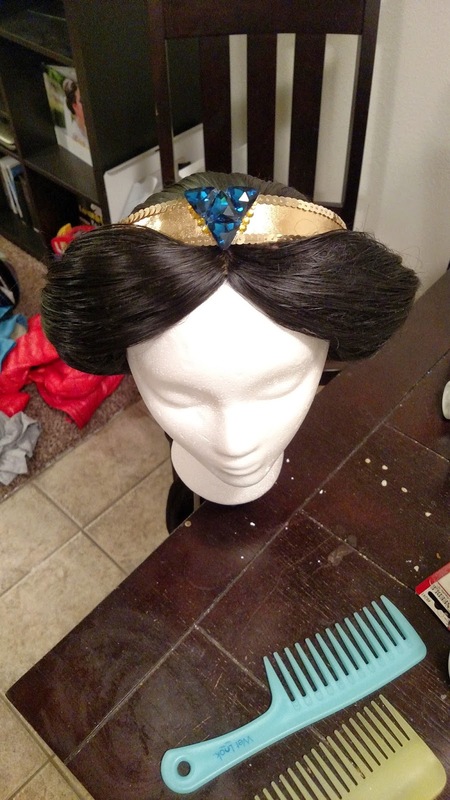 Notice that a little bit of the foam pipe insulation is visible in the center back of the wig. This was later trimmed. 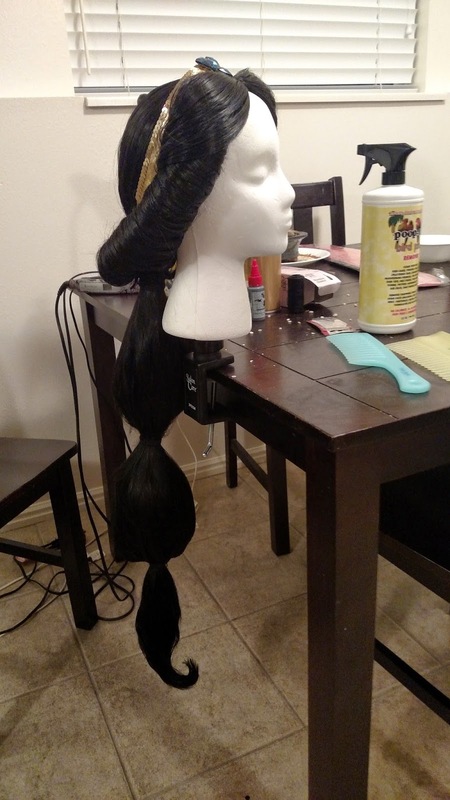 I created the volume in the ponytail sections by stuffing black pantyhose with polyester fiber fill (a.k.a. plush animal stuffing) until it was the size I wanted. I then tied a knot on each end. I made sure the hair was evenly covering this piece, then added a ponytail holder. Each knot of my pantyhose was pulled into the ponytail holder to keep it in place. I wrapped each ponytail section in a hair net. I would recommend double-wrapping this to keep it together. I did have to add a weft on the lower section of the ponytail to make sure everything was fully covered. However, I just glued it rather than sewing it in (EDIT: I regret this!!). Both ponytail puffs were wrapped in hairnets. Once the styling was complete, I glued the headband to the wig using Jewel-It glue. I used hot glue to attach my gold sequin trim to the ponytail holders.